What is a man supposed to do when the refrigerator contains both beer and cheesecke?Of course, evey good dessert needs something with which to wash it down. Likewise, every good beer could use a food companion. Hmm, I sense a pairing coming on. I've read about beer and food pairing and tried it a few times with cheese and chocolate, and often with other foods (ie dinner). I've not really thought about pairing with dessert though. It actually seems that the sweet would clash with the bitter of the beer. This may indeed be the case, and I'm not so sure I'd want an IPA with my cheesecake. Something aught to pair well with it though. World Market had a sale on their "build a 6 pack" of beers and I took advantage of it today (30% discount). My thoughts were that the dark and maltier beers would be the best compliments to the sweet and smooth cheesecake. The suitable candidates would be either the Paulaner Salvator, Tommyknocker Maple Nut Brown, or Bell's Amber ale. The Salvator may pair OK, but I wanted to save it for later. I thought the Maple Nut may end up introducing too many flavors, so settled on the Amber Ale. This beer is smooth, with a nice malty flavor and aroma. Light amber is color, and not too bitter, it is easy to drink. 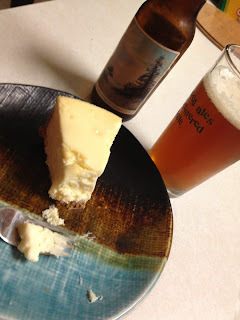 The sweet creaminess of the cheesecake seem to compliment this beer well. Perhaps both are even more smooth than they would be alone. Is the malt character more pronounced with the contrast to the sweetness of the dessert? Perhaps. Would I enjoy this beer as well without the complimenting (or offsetting) sweetness and flavors? I'm not sure. I am sure and glad I gave it a try. I don't often drink Amber ales. This is a decent beer! 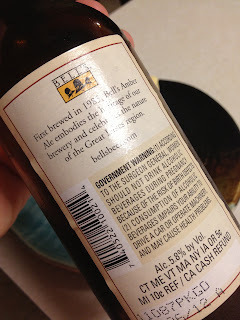 In fact, I've enjoyed most of the Bell's beers. The 6 pack was 50% Bells today, with the Amber, Oberon (which I haven't had either), and Two Hearted IPA (which is very good). I also appreciate Bell's because they give away cool stuff at the Beer Festivals.... just sayin.